I have a confession, it's 70 degrees and sunny today, which is why it didn't seem odd to post a smoothie recipe in the middle of winter. 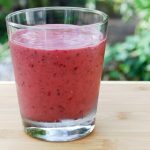 This smoothie is definitely worth a bit of teeth chattering so I suggest you give it a try anyway. This pink and delicious smoothie is a perfect valentines treat... for your digestion, as it is packed with probiotics.